Six kilometres south of the Arctic Circle, in Finland's northernmost province, you find Rovaniemi, the capital of Lapland. 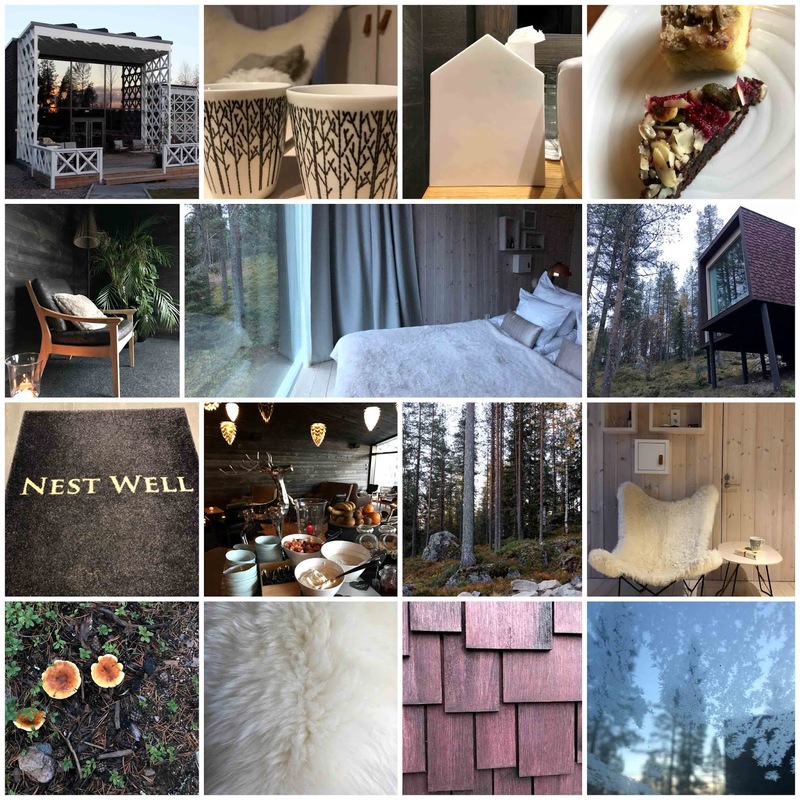 Most people come here to experience stunning nature, learn about Finnish design, to eat and to visit Santa Claus. 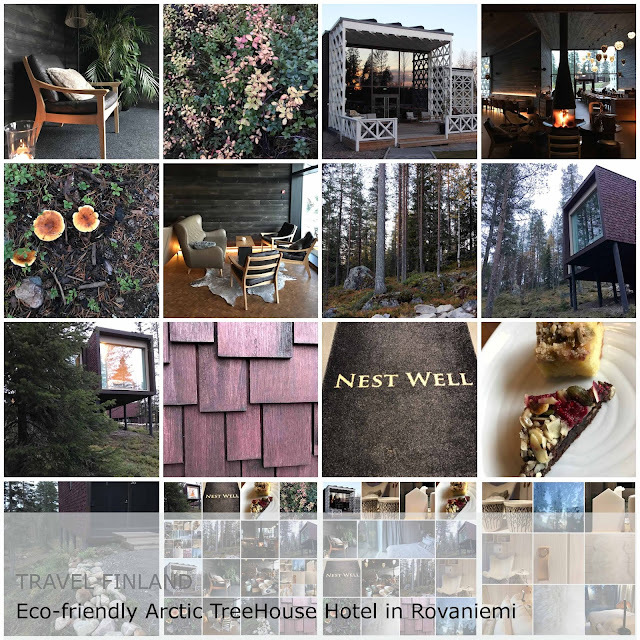 If you, as I do averse the concept of large hotels and love the idea of a luxurious, ecologically minded and owner-run resort and are looking for a place like that right at the Arctic Circle, then this is the place you were searching for. The Arctic TreeHouse Hotel consists of 35 wooden chalet suits occupying several tracks in a hilly forest. On arrival at the main building of the resort, that houses the reception, the restaurant and the bar, you will be welcomed with a warm smile and Finnish berry juice. Have a proper look at the building; can you guess what it resembles? Right in the centre of the white spacious snowflake-shaped building is a large steel fireplace. The design with furniture, lampshades and parquet flooring all in muted brown hues creates a cosy ambience through and through. The fact that the space is only dimly lit is like the icing on the sumptuous cake. The Arctic TreeHouse Hotel is a resort of wooden shingle tiled chalets on stilts, built into the forest on the Arctic Circle. All buildings are built from Finnish sustainably-grown wood and have a living roof covered with vegetation. The green roof provides insulation, is home to birds, absorbs rainwater and it looks simply beautiful on the dark red wooden shingled chalets. The chalets are decked out with bright wooden walls, which not only smell divine but also block out any possible outside noise naturally (I doubt that there is any noise pollution in this forest). Due to its wooden structure, the resort is a playful addition to the surroundings, it is integrated attractively and it is not an out of place complex. The käpylehmä, a Finnish children's toy, a homemade small cow, put together from a pine cone and little wooden sticks gathered in the forest, was the muse for the architect and designer of the suites on stilts. Each chalet has a north-facing feature glass wall with a view right over the wide sky and the valley with its moss-covered pine trees and forest floor full of leaves, branches, berries and mushrooms. The warmth of the wood, the smoothness of the floor (there is underfloor heating), the soft blankets, cushions and white linen in your chalet feel like a gracious embrace. You are aware every single second of your forest surroundings, everything feels so right, and one instantly feels happy and content in this place. Prepare a cup of tea or espresso and snuggle into one of the comfortable chairs or your bed and read or just do nothing except look into the forest. It is the ideal place to log out, put all mobile devices away and just enjoy the serenity and beauty of the forest. There is even a flat-screen TV in your suite. Who needs that with a forest view this unique? It is cleverly hidden behind the curtains, so you won’t have to look at it, in case you aren't a fan. Rakas translated into English from Finnish means “beloved” and they couldn’t have chosen a better name for this restaurant. I dined here several times during my stay. 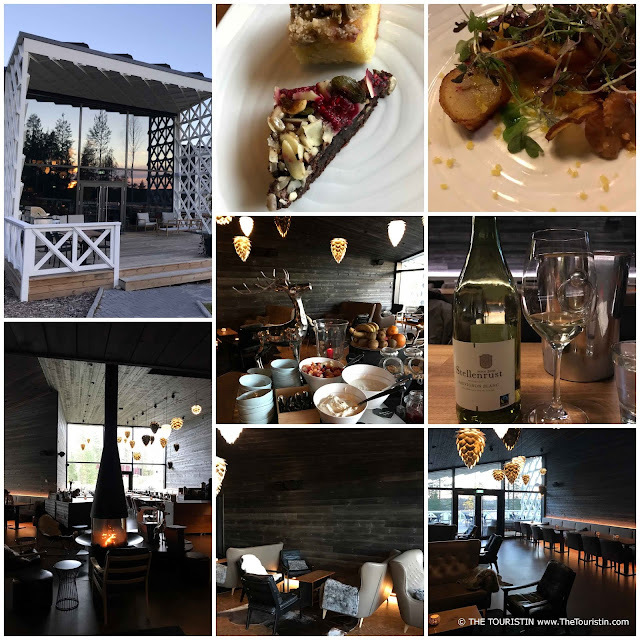 The chef used pumpkin, chanterelle, cured egg yolks, lingonberry & potato crisps, summer cabbage, mushrooms and barley, pickled shallots, crispy kale and wild herbs, sheep milk cheese and it was a true delight. One of the desserts I had was made from cloudberry jam, thyme biscuits and meringue. Most ingredients you eat here grow in the surrounding forest. It is a delight; I love the blissful and stylish flair of this place. In the mornings, breakfast is served in the restaurant, and there are delicious options for vegetarians. Rakas Restaurant & Bar. Tarvantie 3, Rovaniemi 96930, Finland. Hours: Monday to Friday 12pm to 10pm, Saturday 12pm to 11pm, Sunday 5pm to 9.30pm. Expect to pay EUR 60 to 70 per Person for dinner. What else is there to do in Rovaniemi? 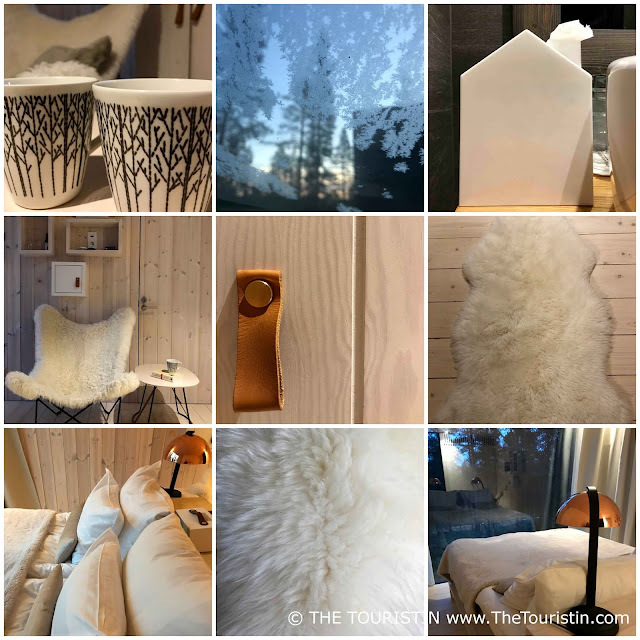 The Arctic TreeHouse Hotel will help you realizing your dream of romantic dinners, meeting Santa, visiting a sauna under the Auroras or to go on an Arctic safari. Please ask for details when booking or on arrival. You can also visit the following places, as there are all within close proximity of the Arctic TreeHouse Hotel: Pilke Science Centre, which is all about trees; the Arktikum, that tells you all about the nature and history of the Arctic and Lapland; the City Library designed by Alvar Aalto. If you love nature, go hiking in the wilderness (in easy reach too) and watch the Northern Lights. Please read Travel Finland. Rovaniemi for First Time Visitors, that also includes all information on how to get to Rovaniemi and when the best time to travel to Rovaniemi is. Tarvantie 3, 96910 Rovaniemi, Finland. From EUR 300 incl. breakfast. Eco-friendly, boutique, romantic, design. Stylish rooms, in all soft white and cream. Yes, in some suites (please ask when booking). Yes, in the bar and in some suites (please ask when booking). Yes, and it is fast. Yes, and the food is served either inside or on the sun terrace. Yes, to and from the airport. There is also a private chauffeur service. Verdict Would I stay at the Arctic TreeHouse Hotel again in the future? Yes. Would I recommend a stay at the Arctic TreeHouse Hotel to a friend? Yes. Are you looking for more eco-friendly luxurious hotels? Spain 3 fabulously special hotels in Mallorca. Australia The Atlantic in Byron Bay. Magical hotel stays - 8 very easy ways to make hotel guests feel at home. The Arctic TreeHouse Hotel supported my research trip to Finnish Lapland by offering a journalist rate. All thoughts are based on my own experiences and feelings.